The Joys of Thai Food! Thailand is known for its cuisine, which combines Chinese, Indian, and Southeast Asian influences. The great characteristic about Thai food is the variety of ingredients. Lemongrass, basil, mint leaves, garlic, coconut milk, chilies, sugar, fish sauce, and a hot and sour sauce are used to produce spicy, sour, sweet, and salty tastes. Dishes with Chinese influences include meat and vegetables stir-fried in oyster or garlic sauce and dim sum. Curries with coconut milk suggest Indian and Malay influences, while skewers of grilled meat with peanut sauce are typical of Malay and Indonesian cooking. Food is cheap, plentiful, and delicious. 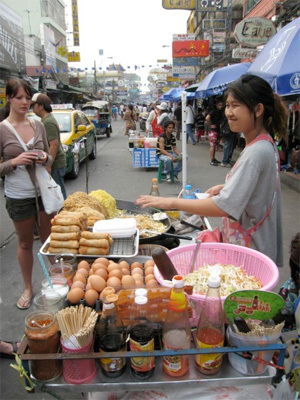 Food stalls can make stir-fried noodle dishes, soups, and rice dishes for 20 to 40 baht. They are in every town and city, and many are open quite late. There are plenty of sit-down restaurants that offer good food for much less money than western restaurants. Prices range from 40 to 120 baht per plate. Compared to western meals though, Thai dishes have smaller portions, so you may need to order two! Be sure to take the same precautions you would in any developing country. Drinking tap water and eating unpeeled fruits and vegetables could lead to typhoid or hepatitis. Consult your physician about getting immunizations before you travel. As a Thai teacher, you will be expected to dress well and maintain a neat appearance. I am not a fan of Thai women's clothing, which tends to be old-fashioned and made of polyester, the heaviest material to wear in heat and humidity. Thai clothing is also not designed for tall or heavy people. If this is you, you will want to pack appropriate clothing as finding it here can be difficult. Bangkok has plenty of big, air-conditioned shopping malls with the latest fashions from the West, but often western brands are nearly twice the price. Custom-made clothes may be the best way of getting affordable, well-designed outfits suitable for hot weather. The Indian trade, which brought over fabric and tailoring expertise, has helped establish Thailand's reputation for quality custom-made clothing. Ask for opinions about reputable tailors and tell them exactly what you want. The shops will have books of patterns and designs you can choose from. A lot of good tailors are located on Sukhumvit Road and near riverside hotels such as the Oriental. I paid about 120 baht for a tailored skirt. Men's suits are a good deal too - a good custom-made suit costs about $200, and a custom-made shirt about $40. World Group Ltd. on Charoen Krung Road near the Oriental is especially good. Some personal items you may want to bring with you are mosquito repellant, sun tan lotion, deodorant, undergarments, and shoes. It is hard to find repellant and sun tan lotion that are strong enough for Thailand, and the deodorant has a sickly sweet smell. Some department stores sell American brands, but they are expensive. Westerners will have a hard time finding undergarments and shoes that fit, and the Thai brands are often poor quality.